I feel like it's been ages since I shared any sock knitting on the blog, but that doesn't mean there haven't been any socks on the needles: my Finished Object Friday post today is all about my Mind the Gap socks. You may remember that I cast these socks on for my Little Bobbins Knits Christmas Eve Cast On, an annual event organised by Little Bobbins Knits, and my very favourite sort of knitalong: cast on some socks on the same day, and post about them and share photos of them on social media as and when you can. These socks were cast on on Christmas Eve 2017, and finally finished on February 16th, when I had a mad blitz of an evening getting them done. This yarn had been in my stash for a long time, possibly over 18 months, but I had been a bit scared of not doing the yarn justice in my earlier sock-knitting days and had always selected other yarn over it. But by Christmas Eve, the yarn's time had finally come. The yarn is based on the London Underground (the Tube) Map, with each colour representing a different Tube line. 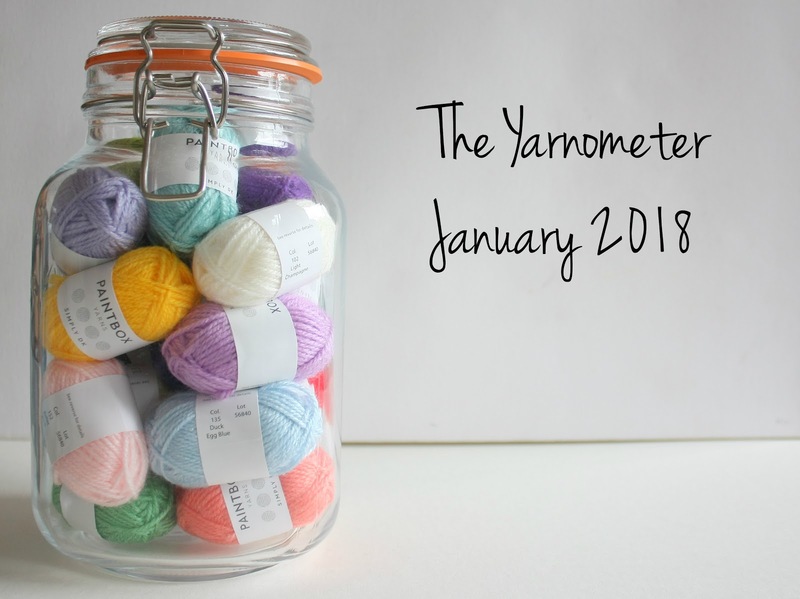 The yarn is pretty spectacular, with twelve different coloured stripes (and, rumour has it, each dyelot has a different stripe order). I decided that I would knit the heels, cuffs and toes using a neutral contrast, and a Fish Lips Kiss heel to avoid distorting the stripes around the heel and got to work. I had originally planned to use West Yorkshire Spinners Signature 4 ply* in Black for the contrast, until I realised that there was black in the stripes, and there was a risk of a black stripe ending up next to the contrast, so opted for the same yarn in Milk Bottle instead. I knitted the first sock over the Christmas holidays, finishing it early in the new year. The second sock took longer, but the time I spent on it was very enjoyable. I decided that I wanted to maximise the amount of yarn I used, but didn't want offset stripes, so I reversed the direction I was knitting the yarn in for the second sock. A minor added complication about using the two yarns together was that they knitted at different gauges. To compensate for this I knitted the cuffs, heels and toes over 64 stitches and the leg over 68. This meant I had to increase and decrease stitches as I moved between sections, which was less than ideal, especially as I forgot for the second sock and somehow ended up having to knit the heel three times. I did get there in the end though! And here are the finished socks. I love them, and their crazy bright mismatched nature. I have enough yarn left that I should be able to knit a second pair using the stripes for the legs and something else for the feet, heels, toes and cuffs. I'm quite looking forward to doing that, and they might even match (or not...). I seem to be struggling to choose books at the minute. January was great of the reading front - I read three books* and enjoyed them all - but this month isn’t going so well on the book front. I started Hidden Figures by Margot Lee Shetterly but it was rather too taxing for my often tired brain (the continued lack of light associated with winter makes me sleepy), so it got put to one side. For something easier I started The Note by Zoe Folbigg, which I had heard about before it was launched at the end of last year and pounced on when it was available in Kindle format for 99p. The premise is simple, and a little preposterous: a girl falls in love with someone on her commute, but is too shy to talk to him, so one day slips him a note telling him how she feels; I’m finding a lot of the characters rather silly - a children’s entertainer who is afraid of stickers - or just rather vacuous. And the parts that go into the man on the train’s relationship with his girlfriend make her sound like the worst person on earth. I will finish it, but it’s not quite the read I was hoping for. Both books are on my Kindle, so when I wanted to read in the bath last week, I had to start something new, and picked up Nutshell by Ian McEwan. I love the idea of this book; it’s written from the perspective of a baby in the womb, who is privy to a plot being created by the adults around her. The heavy literary style isn’t quite what I’m looking for at the minute though, so it’s going slowly (yes, I do keep falling asleep while reading it). There are a couple of books I am really excited about at the minute though: I’m reading The Magic Misfits by Neil Patrick Harris with my son and we are both enjoying it. The book is about an orphan who is looked after by a crime-fighting group of magicians. There are codes to crack and magic tricks to learn within the book, and the writing style is great for reading aloud. I am tempted to read ahead, but am trying my hardest not to so I don’t accidentally spoil any of the surprises! I got Artemis by Andy Weir for Christmas in hardback and it’s firmly at the top of my to-read pile. I really enjoyed The Martian, and suspect this one will be similar (but moon-based rather than set off Mars), but am really excited to get started. I probably ought to finish something first though. Things are looking much more positive on the knitting front. Yesterday I finished the baby hoodie I’ve been working on for the past few weeks. I know I said I would have it finished at least a fortnight ago, but other things got in the way! Now to decide what the next (baby) project should be... in the meantime I’m back to my Mind the Gap socks. I did the heel last night, but when I compared the two socks I realised I’d done last night’s slightly differently, so I’ll have to do that again this morning. Oops. Work knitting is also going swimmingly. 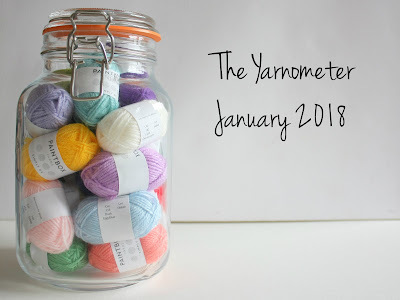 For a bit of variety, I have been doing a lot of crochet this month, which has been an exciting change. I’ve always enjoyed crochet, but don’t find it as versatile as knitting. I have finally managed to design something that will work well as crochet and cannot wait to unveil it to the world! It definitely won’t be my last crochet design - the next one is already brewing in my head. It’s half term this week, and I’m really looking forward to spending some more time with my kids; we’re especially excited about Shrove Tuesday this week: making pancakes is much easier when you don’t have to fit it round the school run! What have you been reading and crafting on this week?